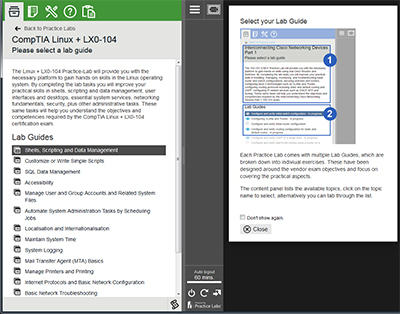 The Linux + LX0-104 Practice Lab will provide you with the necessary platform to gain hands on skills in the Linux operating system. By completing the lab tasks you will improve your practical skills in shells, scripting and data management, user interfaces and desktops, essential system services, networking fundamentals, security, plus other administrative tasks. These same tasks will help you understand the objectives and competencies required by the CompTIA Linux + LX0-104 certification exam.